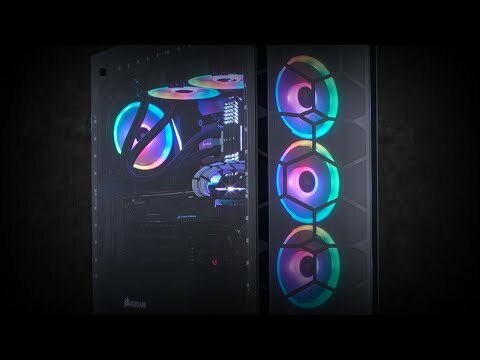 The Corsair LL120 is made for those PC builders that are seeking excellent airflow, quiet operation and the most powerful lighting put into a case fan. You can control the fan speed with PWM that allows you to dynamically control speed from 600 RPM to 1500 RPM to minimize noise or maximize airflow. The LL Series Corsair fans have 16 Independent RGB LEDs in each fan, that are split between two separate lighting loops allowing for nearly endless customization. The two loops let you create vibrant lighting and visual effects. PWM fan control provides dynamic speed adjustment so you can choose to reduce the noise or maximize your airflow. Another amazing feature of the LL series fans is that you to set the fan to not spin when the temperatures are low, allowing you to have near silent computing. If you choose to add more LL fans into your system then with the Triple LL120 Fan Pack you get the RGB Lighting hub and Lighting Node PRO these allow you to use all the RGB functionallities and get the best visuals. 120mm Corsair LL Series, LL120 RGB, 9 Blade, PWM, 16 LED RGB Dual Light Loop, Single Fan Expansion Pack, 4-pin is rated 5.0 out of 5 by 4. Rated 5 out of 5 by Cram808 from They look so good The usual Corsair high quality. Packaging designed for 'unboxing'. You also get cable extensions for both the fan cable and LED cable. With these individual fans you need to connect their RGB cable to an LED hub; I used a Corsair RGB Fan LED Hub connected to a Corsair Commander PRO. Rated 5 out of 5 by B16EM from Light-show Chassis Fans Even just on the default program they silently cycle gently through all colours while circulation air to facilitate cooling. Rated 5 out of 5 by aich69 from For the RGB lovers. I bought six of these to replace my 6 Corsair HD120 RGB fans; had these been around first I wouldn't have switched but for me, the second light loop was enough to make me buy them as well as the black chassis which stems the amount of light thrown out across the whole PC. In a small case these fans are much better at producing an effect and not just spilling light everywhere. Set up is straight forward enough; from each fan there are two cables, one PWM control cable and one RGB control cable. I'm controlling the speed of my fans with the Corsair Commander Pro and then have the RGB fan hub connected to one of the LED ports on the Commander Pro, 4 LED strips from the second LED ports. You do have the option of controlling the fan speeds directly from your motherboard [PWM enabled] and the lighting from the RGB fan hub but I like as much integration as I can so opted for the full Corsair set up and with the advent of iCUE from Corsair it makes even sense to me. For the above set up you need 2 x SATA power and 1 x USB2.0 header on your motherboard [Commander Pro provides 2 x USB2.0 ports so no worries if you only have one on your board and need more than one]. Cooling performance is great and these fans are really quiet; I really only notice them at full speed and even then they are still quieter than a standard case fan [should be at the price I hear you say]. I rarely run them at full speed unless I'm messing about with fan curves. I'm keeping a water-cooled loop with CPU and GPU blocks and 360 radiator at around 25-28 degrees [no overclock] with the 3 radiator fans running at 900 rpm. The LED lighting on these fans is excellent; bright where it needs to be but without massively obvious hot spots. The two controllable rings of LEDs just make an RGB build that little bit more professional looking and the iCUE software now offers a lot more options over the Link software.